Picture collage from a lovely walk in North Wales last week. A 7.5 mile circular walk around the Alwen Dam and Denbigh moors. The dam was built in 1911 and flooded an ancient sheep farm valley in order to provide drinking water for Birkenhead in Merseyside. The route is well sign posted (but we still got lost for a while by not paying attention to the signs). 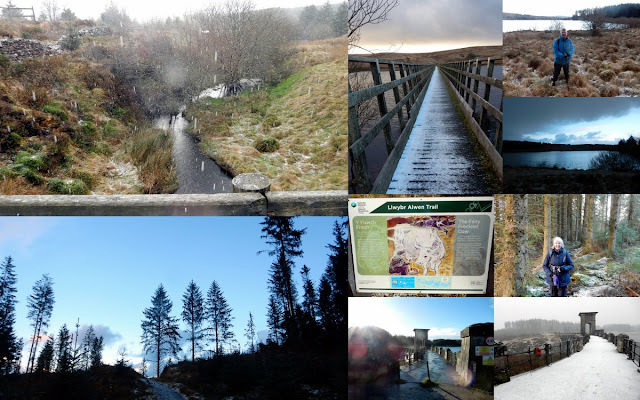 When we started the walk it was cold but dry and in sunshine but typically for Wales at this time of the year there was sudden snow and hail flurries (see picture of the dam bottom right - before and after). The trail passed the ruined cottage and birthplace of the Welsh bard (poet) Taliesin Hiraethog who learnt his craft according to the nearby panel from gatherings of his neighbours who "recited poetry, told tales and played the harp". Called "Nosweithiau Llawen" (Merry Nights). The walk went through forests and moorland with the lake often out of sight. Just before the end we passed a panel which told the local folklore story of the magical "Fairy Freckled Cow" (which sounds more interesting than it actually is and is now the name of an annual cross country race around the dam). A nice varied all seasons walk but make sure you have appropriate clothing (there was a few cold, wet and miserable looking people about who hadn't planned for North Walian weather). Final hint - don't trust the car park postcode for the SavNav. Search Alwen Dam instead.